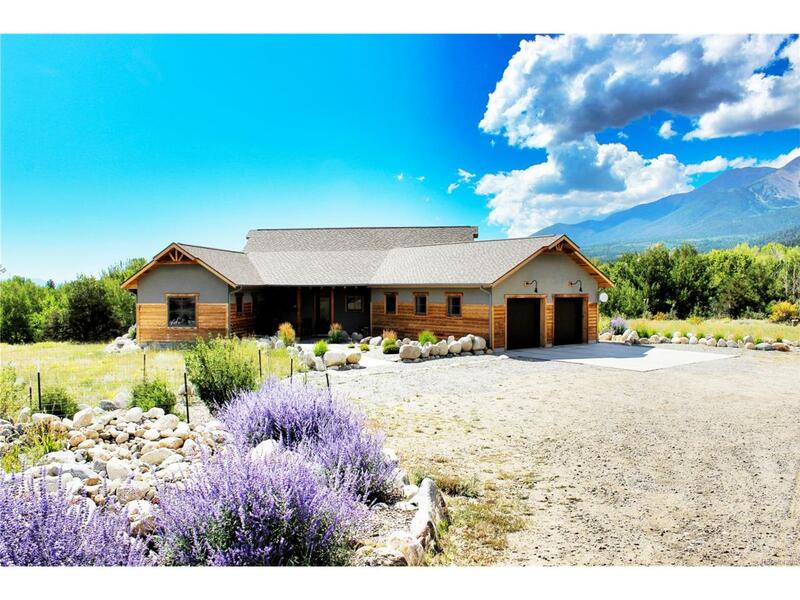 Retreat to the charm and serenity of this rustic mountain contemporary home overlooking Cottonwood Creek with priceless views of Mt Princeton, Collegiate Peaks and Buffalo Hills. Super healthy, energy efficient passive solar design with ICF construction, concrete floors and radiant in-floor heat. Artistic finishes throughout including cherry, granite, industrial iron and eclectic lighting. Main level of home flows seamlessly from living to kitchen/dining area creating a welcoming space for gatherings. Relax in the private master suite with sitting area and vaulted ceilings or soak in the double-ended Victoria & Albert clawfoot tub. Unlimited options with secondary lower level living area and additional guest accommodations. Numerous inviting outdoor patios are perfect for any time of day. 4-car attached garage plus detached Barn/RV with overhead studio space and 12x12 deck. Adjacent to 30 acres of open space with 5+ miles of trails, stocked trout ponds and private event facilities.